A rulemaking process is used to adopt new codes and to change existing codes. When a proposed code change is forwarded to the Department of Community Affairs (DCA), it is first reviewed by a task force consisting of engineers, architects, builders, and contractors. The task force evaluates the proposal and forwards it to the State Codes Advisory Committee if deemed appropriate. The Advisory Committee also evaluates the proposal and submits it for public hearing. If approved, the proposal is adopted by the Board of Community Affairs for inclusion into the next edition of the code. The DCA is responsible for final rulemaking. New editions of codes are reviewed as soon as practicable after publication. Supplements and amendments are updated annually. and amendments is January 1, 2018. Previously, the DCA had decided that the state of Georgia should adopt the 2018 suite of I-codes in lieu of the 2015 codes. See A Statement on Codes from the DCA, page 1. 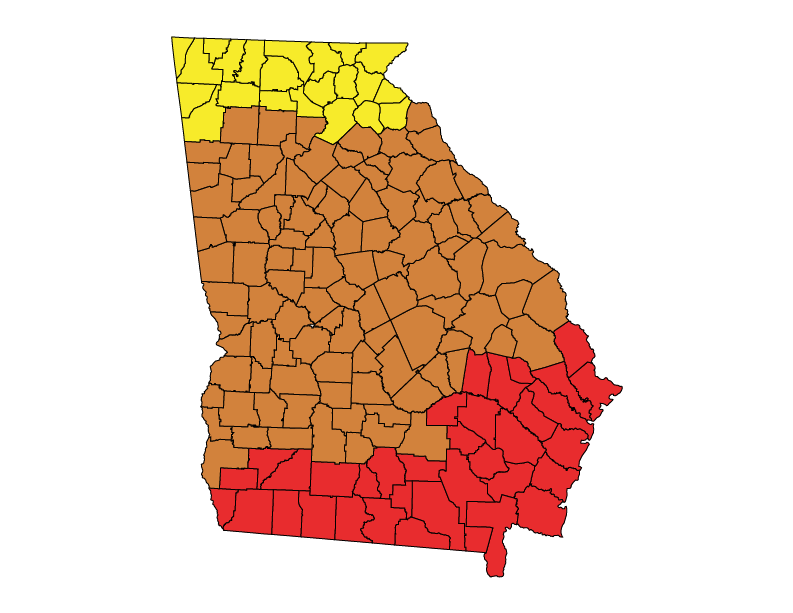 The 2011 Georgia State Minimum Standard Energy Code becomes effective statewide. It is based on the 2009 IECC with 2011 Georgia Amendments (including mandatory blower door testing starting July 1, 2011) as a minimum (mandatory) code. The state also adopts the 2011 Georgia State Minimum Residential Green Building Standard, based on the 2008 National Green Building Standard (NGBS) with 2011 Georgia Amendments, as an optional code for one- and two-family dwellings. It is available for local government adoption and enforcement. Local governments choosing to enforce any permissive codes must adopt the code(s) they wish to enforce, as well as administrative procedures and penalties. This followed the July 29th recommendation of the State Codes Advisory Committee (SCAC) to approve the codes. The Department of Community Affairs (DCA) Board votes to give final approval to adopt the 2009 IECC with 2011 Georgia Amendments (including mandatory blower door testing) as a minimum code and the 2008 National Green Building Standard (NGBS) with 2011 Georgia Amendments as a permissive code. This follows the July 29th recommendation of the State Codes Advisory Committee (SCAC) to approve the codes and a public hearing on September 22nd in Atlanta. On April 22nd, during deliberations on the state’s FY2011 budget, the Georgia Senate votes to remove all of the state’s appropriations for the Georgia Construction Codes and Industrialized Buildings Program. Funding of $218,821 had previously been recommended by the governor and approved in the House budget bill. BCAP and other energy efficiency advocates contact Georgia legislators to support full funding for the agency. House and Senate negotiators in the legislation’s conference committee restore full funding to the program in the final conference report, which was approved by the Legislature on April 29th. The codes program looks to continue its work developing an enhanced version of the 2009 IECC and a residential green building code. The Georgia Department of Community Affairs (DCA) State Codes Advisory Committee (SCAC) 2009 IECC Task Force meets several times to review the 2009 IECC and ASHRAE 90.1-2007. This task force consists of stakeholders from state and local governments, utilities, homebuilders and other private industries. By the conclusion of the final meeting, all proposed amendments to the 2009 IECC and ASHRAE 90.1-2007 have been reviewed and considered. Encourage obtaining ENERGY STAR designation from the United States Environmental Protection Agency to further demonstrate a building project’s energy independence. This Act will also allow major facility projects to be up to 30 percent more efficient than the standards set forth in ASHRAE 90.1-2004 where such an increase is cost effective based on a life-cycle cost analysis. There is also a requirement for major facility projects to achieve a 15 percent reduction in water use when compared to water use based on plumbing fixture selection in accordance with the Energy Policy Act of 1992. This act becomes effective on July 1, 2010. The Georgia State Minimum Energy Code, updated to reference the 2006 IECC and ASHRAE 90.1-2004 for commercial buildings and the 2006 IECC for residential buildings, goes into effect. This code is mandatory statewide. The 2000 IECC with state amendments goes into effect; SHGC 0.40 requirements will be effective the following year. ASHRAE 90.1-2001 also becomes effective, although Chapter 8 of the 2000 IECC can be used as an alternative. The Uniform Codes Act becomes effective in Georgia.